In his introduction to Steve Nelson’s acclaimed book on progressive education, Matt Damon writes, “All children deserve a progressive education, not just a privileged few, an education that will enliven their lives with joy and possibility and help them contribute to the betterment of society and our planet.” What can we expect and even demand of public officials — school board members and local legislators — who decide on the ways in which public schools are run? Steve Nelson argues that we should begin by insisting, that first and foremost, no harm is done to children who attend public schools. He encourages us to consider a Bill of Rights for Children that he presents in the last chapter of his remarkable book along with his conclusions on why progressive education is so important in this time of existential risk. First Do No Harm: Progressive Education in a Time of Existential Risk develops a comprehensive argument for the importance of progressive education in light of the world’s increasingly severe challenges. Current educational practices, particularly in the United States, instill conformity and compliance at a time when authority must be challenged, skepticism must thrive and our students must be imaginative, creative, empathic and passionately alive. The book traces the origins of progressive education and cites the rich history and inarguable science behind progressive practices. Nelson argues that a traditional or conventional approach to education has dominated as a matter of political expediency, not good practice. The book provides an unsparing critique of current policy and practice, particularly the excesses of contemporary education reform. Using anecdotes from his many years as an educational leader, he makes the case in an engaging, colorful and accessible style. 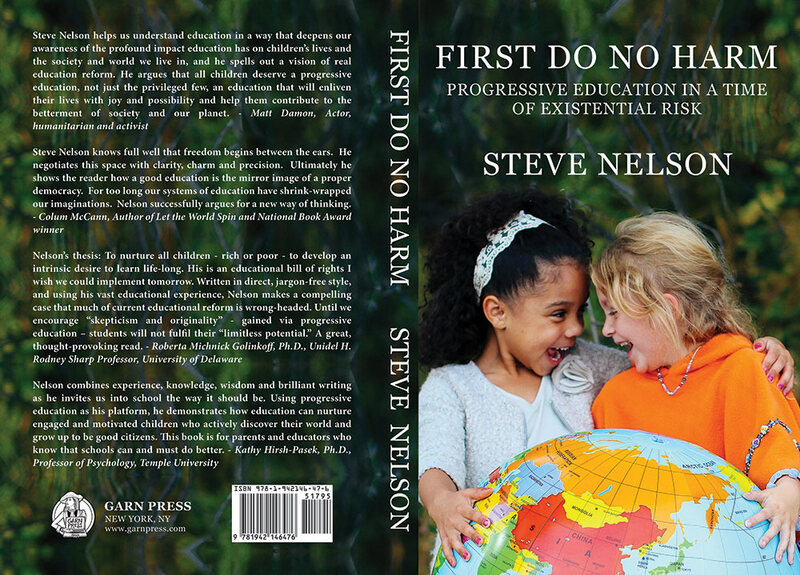 In the final chapter, Nelson offers a Bill of Educational Rights, hoping teachers, parents and all citizens will demand a more joyful, constructive and loving education for the children in their care. “This powerful, entertaining book is both a beautifully-expressed explanation of progressive education and a searing indictment of contemporary education policy and practice. As a teacher, I appreciate the inspirational, good-humored tour of contemporary research and theory. As a parent and an activist, I appreciate the Bill of Education Rights, outlining what we should expect from our schools. As a citizen, I appreciate the clear vision for what education can be — humane, equitable, meaningful and joyful.” Amazon Review, Amazon.